Formerly, in all the communes, there were many ways between the fields, wood .... scattered in the nature. A lot of ways have disappeared with the development of the farms or with the land consolidation. It was necessary to have more exploitable surface and to facilitate the mechanization. The ways which have disappeared were abandoned a long time ago. However over the past few years, the local communities realise the importance of these ways for tourism and appreciate the love of excursions by pedestrian and equestrian, VTT and of course the walkers with their donkeys. Consideration has been given to increasing requests for the reinstatement of these ways, which will play a big part in the development of tourism in these areas. 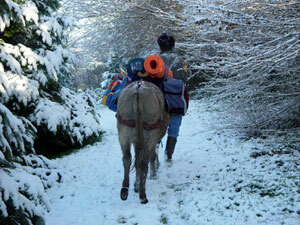 Why hike with a donkey? With training, your donkey can walk 20 to 30 kilometers per day, without tiredness. It should be known that Jacques Clouteau, a famous writer about his excursions with his donkey, has realized long walk, among other the journey between the Mont Saint-Michel and Venice with his donkey. Your donkey will find without problem its food along the ways. If you make an excursion for several days, you will not have a problem to find accommodation for your donkey for one night in a field. The Cotentin donkey is an ideal size for excursions; easy to handle, it is able to carry approximately 40 kg without problem at four years of age. 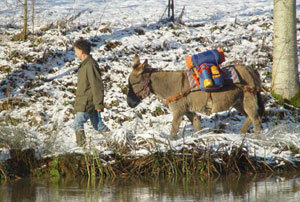 It should be noted that an excursion with donkey is not to carry an adult. This packsaddle allows to hang any bags and it is well suited for excursions. Equipped with two collapsible racks, this packsaddle is very handy to carry equipment.